Due to strict FDA regulations regarding the safety of products, companies are now required to develop and deploy effective Risk Evaluation & Mitigation Strategy (REMS) plans. The ultimate goal of these plans is to both protect the public and ensure access to their products. Although these plans are required, most companies have relatively limited experience with and knowledge of a REMS plan. Despite the FDA continuously implementing various hurdles for pharmaceutical organizations, there are key decisions that can be made that will help to achieve both compliance and commercial objectives. Creating an effective REMS plan for each new product may be a time consuming task — which is why our recent benchmarking report identifies different ways that these groups can save time & still maintain the safety of the product. As evidence from the above slide, REMS often use internal references when developing new plans. 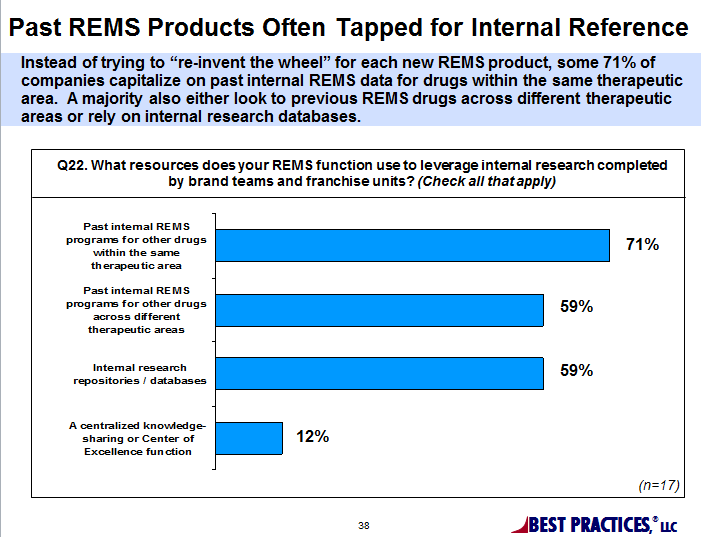 Over 59% of companies even capitalize on past internal REMS data for drugs within the same and across various therapeutic areas. Despite this, most companies do not collaborate with other companies with similar therapies in the development of certain REMS Plan components. However, sharing information is more common than expected, with 35% of companies reporting that they have collaborated across companies. By using internal, as well as external resources to help clear up the fuzzy context of REMS, leaders can significantly increase efficiency. For example, the FDA’s website is the leading external resource used to improve performance and streamline processes. This is a critical source for professionals, as it gives direct, clear information on governmental requirements and restrictions. Identifying and making good use of these critical sources can help to make the entire REMS plan making process more clear and make your company more effective at avoiding risky business.